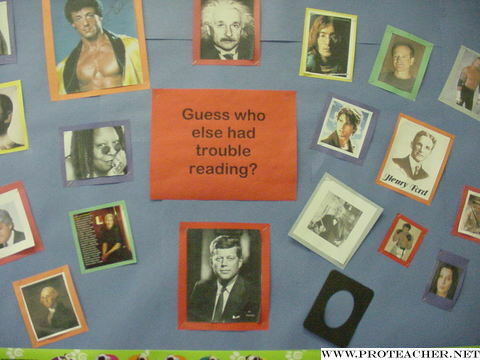 Guess Who Else Had Trouble Reading? I teach 7th and 8th grade students that struggle with reading. I use this bulletin board in September as a starting point. I ask the kids to identify as many of the people on the board as they can. I give a small prize to student with the most correct answers. After everyone is identified I ask the kids to tell me what all the people on the board have in common. Answers vary but the gist is, they are all famous, successful and creative people. Then we talk about another common trait they share.. they are all dyslexic or struggled with reading in school. I usethis asa springboard to talk about dyslexia and what we will be working on to improve the student's reading. I leave the pictures up as a reminder that reading problems can be overcome and that dyslexics have wonderful, intelligent, creative brains.